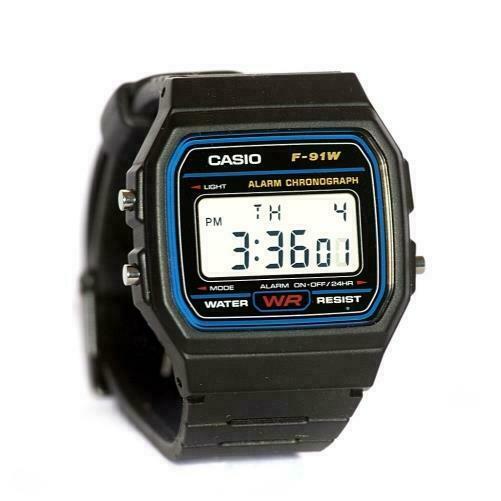 eBay Casio Men's F91W-1 Classic Black Digital Resin Strap Watch A tried and true style great for casual wear. With its daily alarm, hourly time signal and auto calendar, you’ll never need to worry about missing an appointment again. Black Casual Classic watch with a Resin Band.Water Resistant Micro LightDaily Alarm1/100 second digital stopwatchMeasuring capacity: 59'59.99"Measuring modes: Net time, split time, 1st-2nd place timesHourly Time SignalAuto Calendar Accuracy: +/-30 seconds per monthBattery CR2016Approx. battery life: 7 yearsModule 593 Welcome to ShopEmco! We thank you for stopping by, and look forward to servicing you by providing you with the best possible customer care. Shipping on most orders are within 24 hours. We are happy to ship to all International destinations provided the manufacture does not restrict us to do so.We are happy to ship orders to all international destinations. Please note we are not responsible for customs and duty fees. Fees may be collected at delivery by your local carrier depending on the policies of every individual country these fees are determined by your Country and we are unable to provide this information.